Congratulations to Jayden Algarin, a 1st grader in Mrs. Jones class was chosen to represent Annette Perry as the School Board Super Star for December! We are proud of you Jayden! 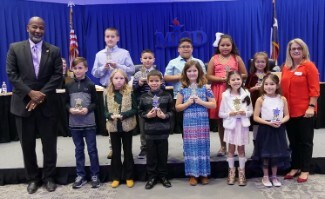 Each month during the school year, students from our elementary schools are selected to receive the School Board's Star Award for outstanding citizenship. These young students have been chosen from their campus based on the virtues of outstanding character, citizenship, fairness, honesty, kindness, respect, responsibility and trustworthiness.